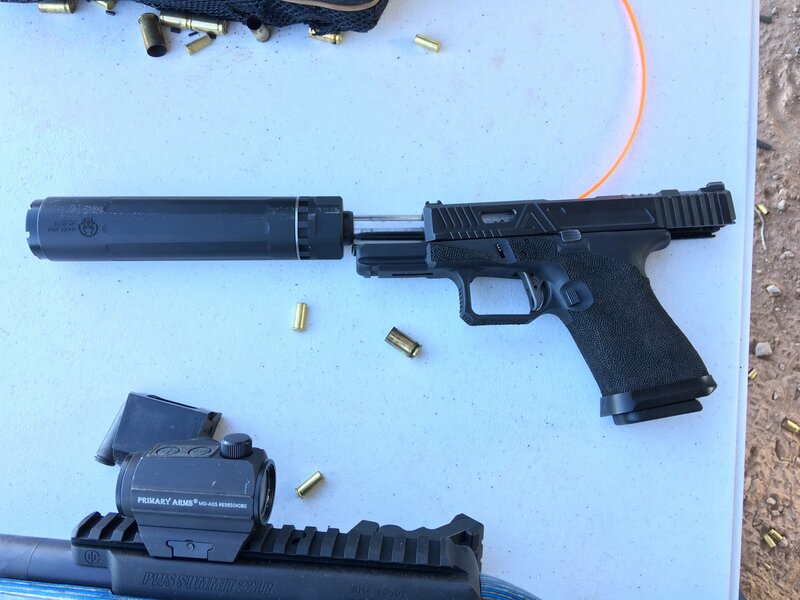 Dead Air Armament (DAA) Ghost-M 9mm Pistol/Submachine Gun (SMG) Silencer/Sound Suppressor and Front Sound Module (FSM) on an Agency Arms Urban Combat Glock 19 (G19) Tactical Pistol! (Video!) | DefenseReview.com (DR): An online tactical technology and military defense technology magazine with particular focus on the latest and greatest tactical firearms news (tactical gun news), tactical gear news and tactical shooting news. 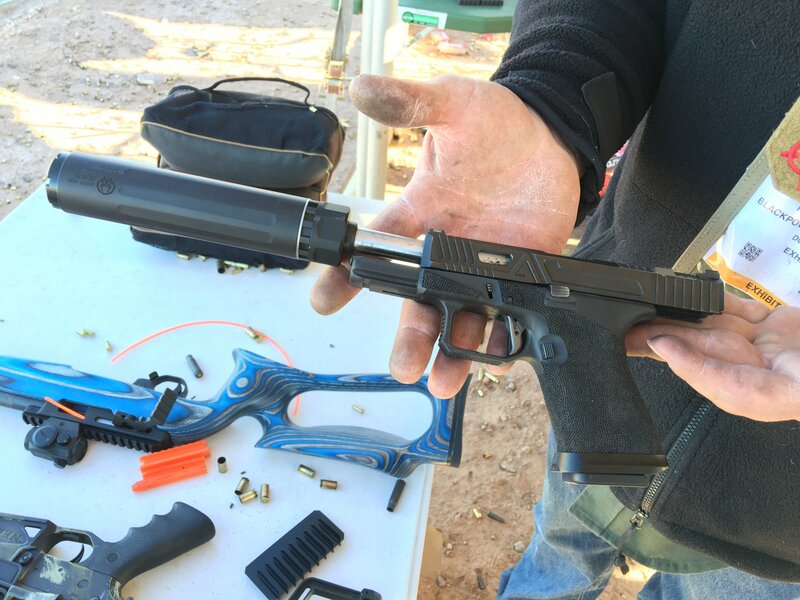 Dead Air Armament has a pretty slick-looking .45 ACP pistol/SMG (Submachine Gun) silencer/sound suppressor called the Ghost-M. DefenseReview (DR) got to check the Ghost out earlier this year at SHOT Show 2016, and we liked what we saw and heard…or, rather, what we didn’t hear. 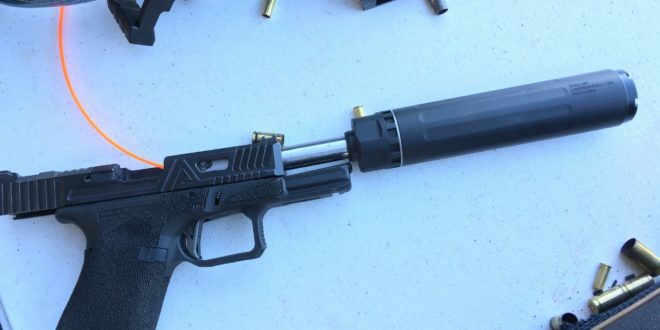 The DAA Ghost-M suppressor utilizes a modular piston mount for functioning, and it also accepts a “Front Sound Module” (FSM) on the front for further sound attenuation/mitigation. We don’t yet know how much the FSM enhances sound suppression in terms of decibel reduction, but we’ll try to find out, and modify this article accordingly. 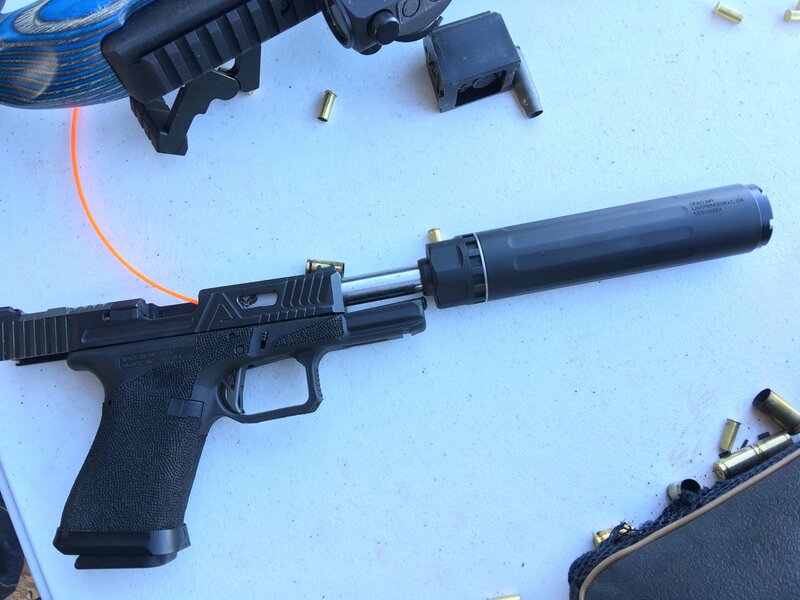 The particular pistol onto which the Dead Air Armament Ghost-M pistol/subgun suppressor was mounted at SHOT Show Industry Day at the Range 2016 was an Agency Arms (AA) custom Glock 19 (G19), which sported a nice Agency Arms Hand Fitted Trigger, and what appeared to be an Agency Arms Urban Combat Edition Slide. DR didn’t experience or witness any malfunctions at the range, but our round count was limited, so we don’t have any high-round-count data on that gun. We here at DR aren’t big fans of slide cutouts (where the slide is cut all the way through, alllowing you to see the barrel) on pistol designed for concealed carry (CCW) military use, i.e., hard use under adverse combat conditions, as slide cutouts will allow more dirt and debris to enter into the action, creating a greater chance of a debris-related malfunction. A lightened slide also requires that the gun be specifically tuned for that slide with the appropriate, compensatory spring weight. So, if DR were to have Agency Arms build a custom G19 for us, we’d most likely go with the Agency Arms Field Battle Edition G19 Slide. Editor’s Note: DR’s current favorite custom Glock pistols are the Nous Defions/Arsenal Democracy Blackside custom Glock pistols, which are quite minialist in terms of modifications. Every mod on a Blackside Glock pistol has a functional purpose. 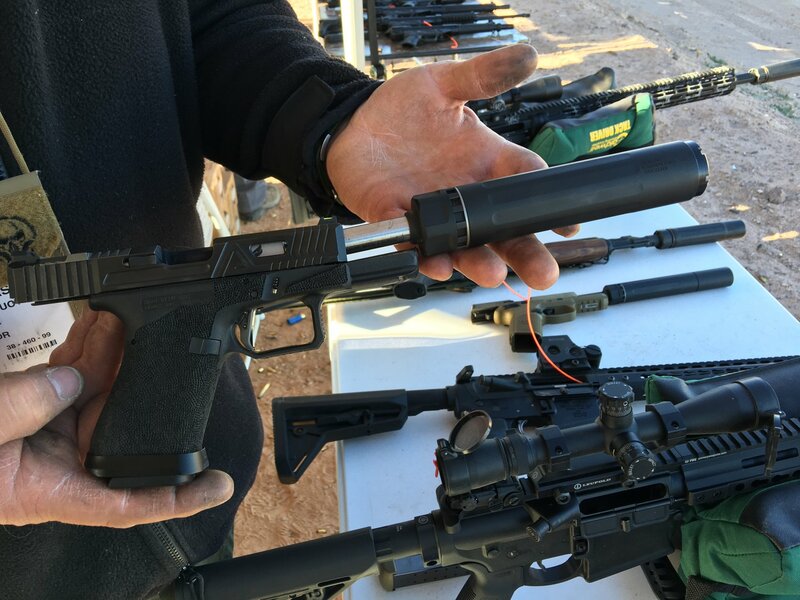 Anyway, subsequent to our range session, we shot some secondary video of Dead Air Armament president/CEO Mike Pappas discussing removing the Front Sound Module from the Ghost-M suppressor at the DAA booth in the exhibition hall, and that’s also worth watching below. Previous: SureFire Optimized Bolt Carrier-Long Stroke (OBC-LS) Drop-In BCG and H7S Buffer System with Longer Action Spring for Better Weapon Control, Reliability and Durability: Best Tactical AR-15/M4/M4A1 Carbine/Short Barreled Rifle (SBR) Bolt Carrier Group/Buffer System Combo Ever?